How I learned to love Autopilot. Perhaps the worst driving experience of my life happened in 2009 while helping a friend move. She could only afford to rent a rusty van for a single day, so I agreed to make the 14-hour round trip from London to Scotland and back again in one shot. After setting off at 9 AM, we arrived at 7 PM, some four hours behind schedule, thanks to bad traffic. I started the 450-mile home leg at around 9 PM, and the entire journey was a battle to stay awake, alert and within the confines of my lane. Plenty of coffee and roadside breaks later, I arrived home at 6 AM, 21 hours after setting off. It was the most unsafe I've ever felt in a car. 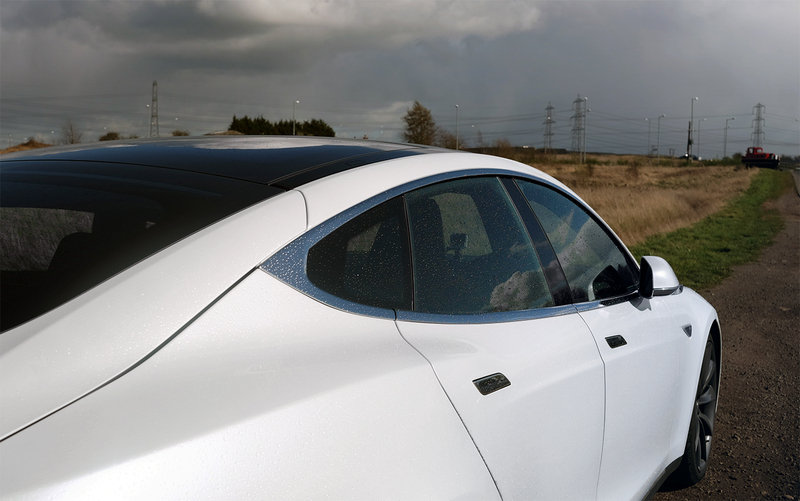 When Tesla offered us the opportunity to test out its semi-autonomous Autopilot feature in the Model S, my thoughts immediately went to Scotland and that traumatic journey. While I'm never going to trade my VW Golf for a car that expensive, the new Model 3 will arrive at $35,000 with many of the same capabilities. So I saw the opportunity to take an extremely early Model 3 test drive, of sorts. I wanted to know if it could make a cross-country journey on electric power, and see if the Autopilot would have made that long trip to Scotland a little less arduous. To test this theory, we would drive up to the north of England -- Scotland just wasn't practical given the time constraints we were under. We'd then stretch out the process with some video and photo shoots, before heading home hopefully somewhat exhausted. On the trip back to London, we'd then make use of the autonomous features -- about 90 percent of the journey back could be driven by the Tesla, with limited human oversight. My colleague Matt Brian picked up the Model S -- a $120,000 (£110,250) P90D, to be precise -- from Hounslow, on the outskirts of London. From there we'd take the M25 freeway, which encircles London, before setting off on the M1, the main road heading north. We chose Leeds, a city around four hours away in the north of England, as our destination. Because the Tesla is electric, though, we'd need a charger to get us there. Or at least back. The basic route, as dictated by Tesla's Supercharger network. The car's GPS said we could feasibly get to Leeds on a single charge but, erring on the side of caution, advised us to stop at a Supercharger along the way. We'd also need to take some photos somewhere a little more picturesque than a car park. In the end, we decided on a simple 202-mile, four-hour route, taking us up through the heart of England with two stops on the way to Leeds. There, we'd park at a hotel that had a pair of chargers. After eating at the hotel and charging the car to 100 percent, we'd begin our return journey. We'd head off just after rush hour and follow the M1 back home, but rather than return to Hounslow, we'd finish at the Emirates Stadium, in north London. The major difference between the two routes, though, would be Autopilot. Factoring in charging, eating and videography, we thought we'd be back in London by around 10 PM. We reached our first stop, in Northampton, at 2 PM. We'd traveled just 80 miles since meeting three hours prior. Luckily, the Supercharger is very swift. Much like phones with a fast-charging feature, it's quick to charge up to 80 percent or so, then slows down significantly for the final 20 percent. When it's close to empty, though, you can get 60 miles' range in under ten minutes, and half an hour gets you 170 miles. With no local Supercharger, I'm using local electric charging points. I could be a while. Tesla's been expanding its Supercharger network rapidly over the past few years, and you can see why. To a Tesla owner, they're the difference between minutes and hours. 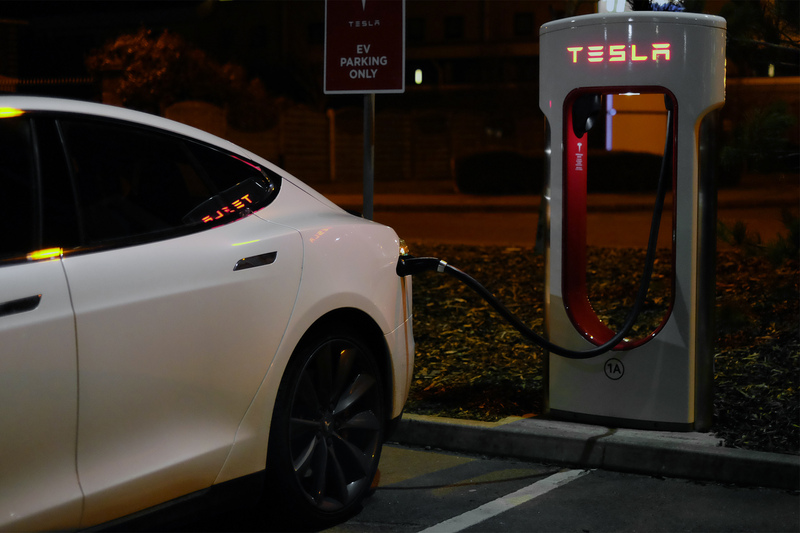 In the lead-up to the Model 3 launch, it's pledging to almost double the number of stations worldwide to 1,200, which will house 7,000 individual chargers. That will go a long way toward patching the holes in the current network. In the US, for example, traveling away from the major conurbations in each corner of the country requires forethought. You'll typically need to stick almost entirely to the major interstates -- I-90, which cuts through the north, is peppered with Superchargers, as is I-70, through the center, while I-40 is covered from Oklahoma City west. A road trip in a Tesla isn't about driving from point A to point B. It's about getting from Supercharger to Supercharger. The whole "range anxiety" thing is perhaps overstated. The Model S comfortably lasts 200 miles, which is more than enough to cover most people's daily driving. And there are plenty of solutions for overnight charging at home, which would be enough to keep my imaginary Tesla running almost year-round. But longer journeys are obviously a different matter. Even if you're on a route that's well covered, it feels like any road trip in a Tesla right now isn't about driving from point A to point B -- it's about getting from Supercharger to Supercharger. We charged for only about 15 minutes in Northampton. Enough that the Tesla said we'd hit Leeds with 25 percent in the metaphorical tank. Setting off north again, we encountered heavy traffic, and also stopped en route at a power station to shoot (most of) the photos you see dotted around this article. Despite that charging stop, though, when we reached Leeds at 5:20 PM, we had less than 10 percent left, and a "battery low" warning on the Tesla's display. Not the best start. The discrepancy between the prediction and the reality was mostly down to traffic, but just as with a gas-powered car, your driving style will affect your mileage, as will weather conditions -- it was about 50 degrees and very wet for most of the day. The only things available at the soulless hotel we stopped at in Leeds were a Supercharger and some overcooked burgers. Filled up on both, we set off for home at around 7:30 PM. We hoped that once we handed the reins over to the car, energy consumption would be reduced. We also prayed we'd have better luck with traffic. Five minutes after departing, we were on the M1 and ready to try Autopilot. There's a little lever to the left of the steering wheel, and pulling on it once will activate cruise control, which behaves as you'd expect, with a few additions. A second pull takes you into full-fledged Autopilot mode. In cruise control, the Model S will watch the adjacent lanes to check for vehicles that might encroach, and read road signs to automatically step the speed up and down if you enter, for example, a 50MPH zone. Once you're in Autopilot, additional sensors come into play, and the car will follow the road's curves, keeping you neatly in your lane. It'll also change lanes for you, if you ask. To do this, you just need to pull the indicator, put both hands on the wheel, and the car will check its surroundings and switch lanes if it's safe. The hands thing was a concession added by Tesla after Model S owners were being a little ... irresponsible. Autonomous lane changes were typically super-smooth, although we had a couple of jankier moments at night where it jaunted across lanes either too fast or too slow for my liking. There were also a few occasions when it decided switching wasn't safe, even though there weren't any vehicles around. Tesla seems to be overly cautious here, which is fine, but you really need to be paying attention -- if it backs out of a lane change halfway through, it'll sometimes hand you back the wheel. The biggest issue we ran into with Autopilot was the variable speed limit on the M1. The Model S happily read the myriad speed changes, going back and forth between 70MPH and 40MPH and everything in between. More than once, though, the road returned to the UK's highway speed limit -- 70MPH -- without clearly indicating that change with a sign. The Tesla remained at 40MPH, which on a 70MPH road is extremely dangerous. It was another illustration that Autopilot is a driving aid, rather than a full autonomous mode. Treating it otherwise, or not paying attention, would likely leave you less safe than you were without it. We ran into similar issues with non-official signage -- the UK sometimes has "suggestions" like "Slow 40," which isn't actually a speed limit but rather an indication that there's a potential hazard ahead. The Tesla ignored these, which is legal, but not exactly advisable. Luckily, changing the vehicle's designated speed is simple -- a quick toggle up or down will change it in predefined increments -- and anyway, the cruise control safely slowed us down when it saw a car in front doing the recommended 40MPH. When one of us mere humans took the wheel, the ride was noticeably less steady, less controlled. Despite those minor niggles, the semi-autonomous journey home went well. 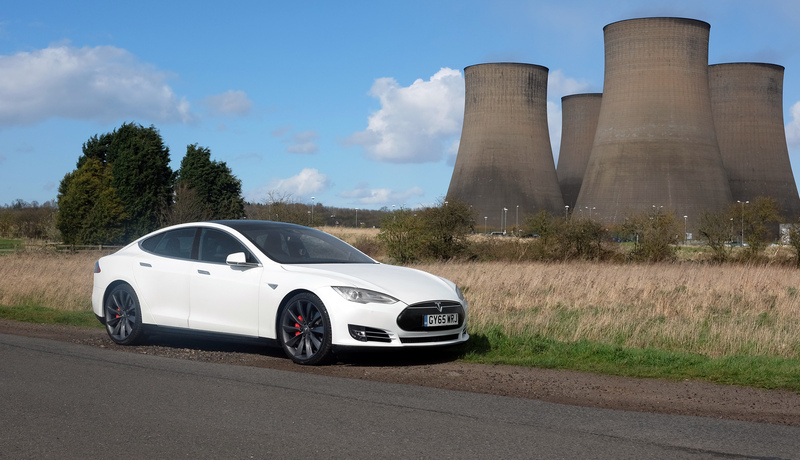 And the Tesla handled some typically British -- i.e., godawful -- weather conditions with aplomb. Driving at 70MPH during a downpour on an unlit stretch of the M1 is not something I would do in my car, but with a computer at the wheel I felt comfortable. On the few occasions when one of us mere humans took the wheel, the ride was noticeably less steady, less controlled. Less safe. I would like to see Tesla add a little more intelligence to its Autopilot when it comes to wet conditions. As of this writing, the Model S can't tell if you're driving on a wet or dry road. That's important. When we set off back to London, the weather was fine, and we it set to maintain a distance of three car lengths at all times. An hour later, we were caught in a torrential downpour, and that three-car distance felt way too close. While a passenger can safely navigate the Tesla's menus to change this, if you're driving alone, you need to fiddle about with the Autopilot lever to adjust it on the fly. A simple solution would be to use either sensors or real-time weather info from the web to automatically switch between predetermined dry and wet weather settings. 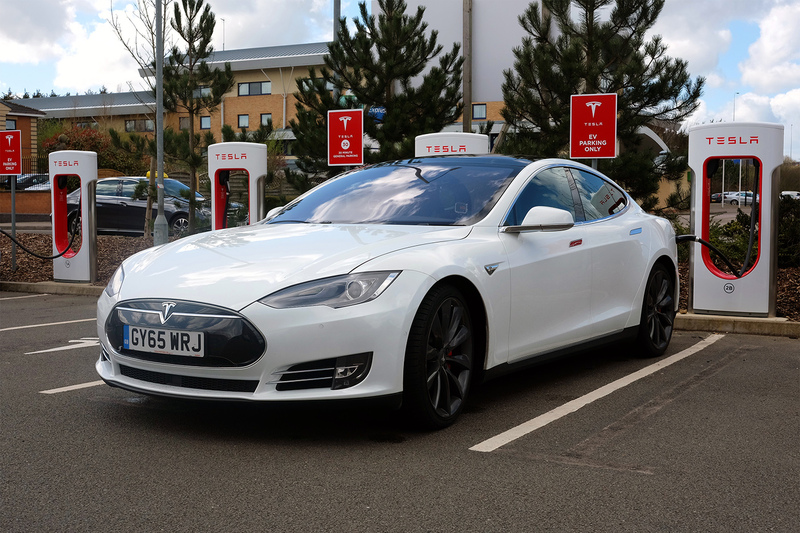 We ended up stopping again at the Northampton Supercharger for 15 minutes -- our original plan hadn't factored in Matt driving the Model S back to his home, 50 miles out of London. The break gave us a chance to talk about what had and hadn't gone right with the journey so far. The Model S was definitely keeping us safe. And it was getting us home fast. We both agreed that, if we were driving the car in such inclement conditions, we would have been taking things a little slower. Despite nerves about handing over control to a computer, it was definitely more relaxing driving assisted than solo. I've said this already, but just to reiterate: I am almost definitely never going to buy a Model S or any car in its $70,000+ price bracket -- there's a reason the phrase "overpaid journalist" is rarely uttered. By 11 PM -- the time we reached the Emirates Stadium -- I was enamored with the idea of a Tesla. I don't think the Model S offers the comfort or luxury of the BMWs and Audis I typically lust after. But the Model 3 will fall into the price range of my Golf. And it'll offer all of the Autopilot features, most likely for a small premium. That's a compelling notion. I don't think I'm willing to dive in and order a Tesla based on a single day's driving. But the intelligence and composure the Model S showed in its autonomous mode was enough to persuade me that Autopilot is definitely a feature I want from my next car. I'm not exaggerating when I say the memories of that journey back from Scotland haunt me, and having with Tesla's safety features on board would have made a world of difference. Video produced by John Johnston, Matt Brian and Aaron Souppouris.